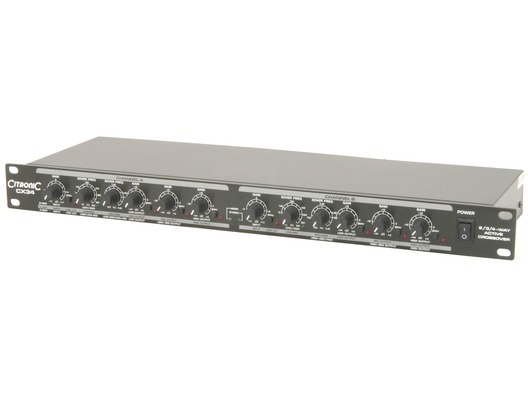 Citronic CX34 is a 2 or 3-way stereo or 4-way mono active crossover designed to split frequencies so that low frequencies are delivered to the amp driving the sub cabinets and mid/top frequencies are delivered to the amp driving the mid/top frequency cabs. This type of system is more efficient and delivers more accurate sound quality, especially in larger PA systems. The Citronic CX34 Active crossover is a total must for those who want total sound perfection from their sound rig. Here we have the Citronic CX34 2/3/4-Way Active Crossover in brand new condition and in B-Stock. The B-Stock versions would have been on display at a training evening or trade exhibition only and will come boxed 'as new' with all accessories and a 1-year warranty. Good solid build with robust controls. I particularly liked the LF sum feature as it allows both A and B LF channels to combine as one, so you don't lose power if using a single subwoofer. I've never had a problem with mine so far so I would recommend it and say it's worth the investment. Build quality is very good. Solid front panel with robust controls. Does what it says on the tin (as the saying goes). For me personally it lacked "Clip" indicators and a multi-band limiter, but I learnt this crossover has continuously adjustable cut-off frequencies, and in my experience it's been impossible to overdo this crossover with a hot signal. I particularly like the "LF Sum" feature which combines the A&B low frequency outputs, useful for my setup where I use just a single subwoofer but want the power of both LF channels. I've never have any problems with mine thus far, it just gets on with the task and doesn't complain. I'd recommend it, definitely worth the money.